The sun-drenched, verdant lands of Corfu, lapped by cobalt water, have long been a popular destination for those seeking sun, culture, history and a rewarding holiday experience. From an impressive capital town brimming with historical buildings and a thriving year-round scene, to remote, deserted hamlets, hidden amongst the olive groves on a mountainside, Corfu has something for everyone. If you are looking for quality self-catering accommodation with a private pool for the family to enjoy on Corfu, take a look at the following three fabulous Vintage Travel villas on Corfu. For families of up to five wanting to stay near the lively island capital Corfu Town with stunning sea views, let us introduce you to a beautiful villa known as Evie. Evie has three bedrooms, two bathrooms, and is just a stone’s throw from Corfu Town and its many great shops, restaurants and sights. 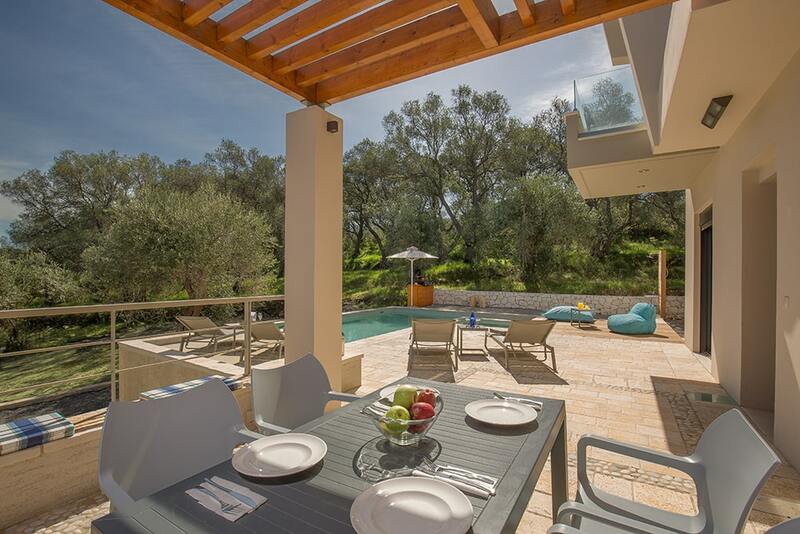 This grand, contemporary villa boasts an open-plan design and has all the mod-cons you’ll need for a ‘home-from-home’ stay in the heart of Corfu, including Wi-Fi and air-conditioning. Evie enjoys fantastic views across the Corfu Town that stretch across to the deep blue sea in the distance. A lovely garden bursting with trees, flowers and tiered walls, make Evie the perfect place to enjoy the unique beauty of Corfu. Stefania to the North East of the island, is another fabulous choice of villa for families of four. This modern villa’s terraces, balcony, garden and private pool enjoy incredible panoramic views that extend across a carpet of olive trees, to the outskirts of the village of Acharavi, out to the Ionian Sea and to the Albanian mountains in the distance. Corfu’s North East coast is home to a great choice of family-friendly beaches and attractive towns, including Almyros, Astrakeri, Apraos and Spyridonas, all of which are just a short distance from Stefania. For larger families of up to six, the three-bedroom, three-bathroom villa of Myrto might be the perfect caper for a fabulous base to explore this beautiful part of Corfu. Myrto is a pretty, two-storey villa with a modern design that’s just a two-minute stroll to the atmospheric coastal village of Kalami, with shops, tavernas and a beach. Myrto really makes the most of its enviable position and incredible views, with large glass doors opening onto a spacious terrace, where guests can enjoy a glass of wine in the evening, a cup of coffee in the morning or a leisurely read of a good book, while taking in the fabulous surroundings, looking down of village rooftops and stretching across to the nearby sea.